Horror anthologies have experienced a resurgence within the last five or so years, but anthologies revolving around Halloween are few and far between. In fact, only the great “Trick r’ Treat” comes to mind and many moviegoing fans of the spooky holiday didn’t even know about it until it was on DVD. 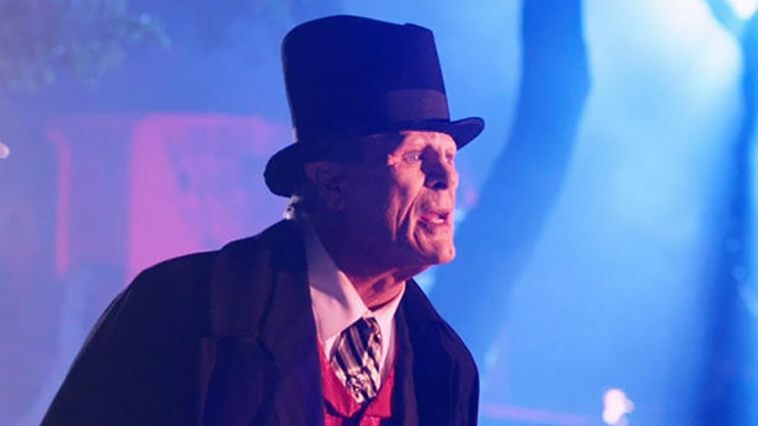 Now, there’s “Tales of Halloween,” which offers a ten macabre tales all occurring on Halloween night in suburbia. While the tone of the anthology may veer on the goofy side, there’s a good share of blood, decapitations and dismemberments – primarily on a limited budget with some fun cameos sprinkled throughout. The shorts however are a bit too short for my taste, with many of them not accomplishing much within their brief time, but consider it a fun-size sampler treat. The feature opens with a local radio DJ (Adrienne Barbeau) setting the tone on Halloween night and monitoring random creepy behavior breaking out in the area. Then we got on with the shorts, occasionally coming back to the horror maven’s sultry voice. Directed by Dave Parker, “Sweet Tooth”, tells of an urban legend that comes to life when babysitters decide to consume the candy stash they didn’t earn. “The Night Billy Raised Hell”, directed by Darren Lynn Bousman, is up to no good as the Devil (Barry Boswick) next door uses the holiday to spread evil pranks and wicked mischief. “Trick” is directed by Adam Gierasch and explores trick or treating child killers dispensing terror on a specific group of partying adults. Paul Solet directed “The Weak and the Wicked” offering another tale of retribution on a trio of neighborhood bullies. “Ding Dong” is directed by Lucky McKee and it follows a childless couple who experience a Grimm-style awakening in their creepy marriage. “Grim Grinning Ghost” follows a party girl making her way home after a night of spooktacular storytelling that becomes all too real, directed by Axelle Carolyn. John Skipp and Andrew Kasch directs “This Means War” which finds two hostile neighbors defending their holiday displays. “Friday the 31st” is directed by Mike Mendez and features a Jason-type masked killer who meets his match when a tiny, trick-or-treating alien shows up. John Landis makes a cameo in “The Ransom of Rusty Rex” which finds two bank robbers in over their heads when they kidnap what they think is a wealthy man’s son, written and directed by Ryan Schifrin. Finally, director Neil Marshall delivers a fun tale of a malevolent giant carved pumpkin that goes on a killing spree, forcing detectives (Kristina Klebe and Pat Healey) to track down the source of this aberration (including cameos by Joe Dante and John Savage). “Creepshow” and “Tales from the Crypt”, two series which harken back to horror comics such as Creepy or Eerie, are hard to beat when it comes to delivering scares in a limited amount of time. 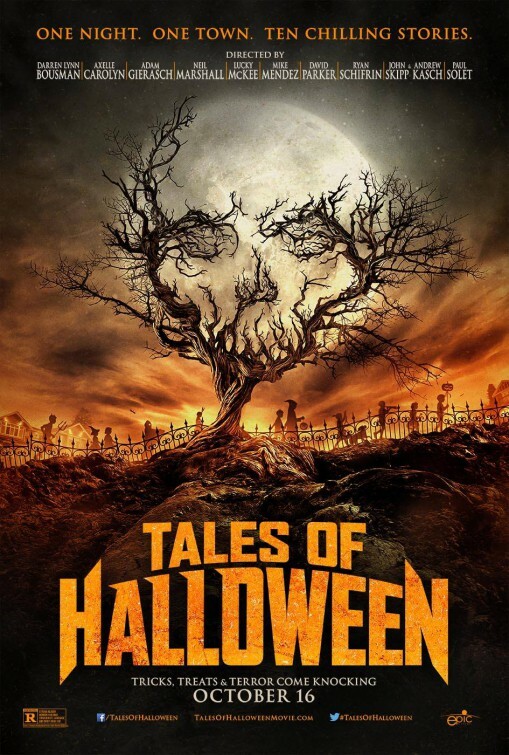 “Tales of Halloween” does one thing wrong from the start by including an extended main title sequence that identifies filmmakers before the shorts have been screened. This is a wrong move since by the time each short comes around, we forget who the filmmakers were and what the title is. The anthology moves along through the neighborhood, crafting a gradual spell that includes: parents, neighbors, kids, creatures, aliens and serial killers. Typical of most anthology pictures, the quality of these shorts is up and down and all over the place. Most of the devious endeavors are dedicated to adding a degree of menace to the movie as a whole. In these shorts, children are featured substantially, finding little kids involved in violent acts if you’re into that sort of thing. Some of these are straight forward, like “Trick”, which winds up being unnecessarily confusing, while “Sweet Tooth” has a special affinity for wicked turns, playing up the whole gorging of candy aspect that winds up being a real intestine ripper. I got a kick out of seeing Bostwick have devilish fun in “The Night Billy Raised Hell,” who spends his night troublemaking with a diminutive demonic cohort. The rivaling neighbors short “The Means War” was probably one of the more successfully executed shorts, using its time wisely and providing an engaging set-up. The performances by Dana Gould and James Duval utilize a great sense of physicality and the directors have an appreciation for twisted escalation that sadly feels like something we might wind up seeing not the news. One of the shorts that could’ve easily been a fun feature-length romp is Neil Marshall’s “Bad Seed”. It’s easily the most elaborate of the shorts, blending police procedural satire with funny, gruesome pumpkin kills. With Marshall being a director I’ve followed for some time and admire, it was definitely a good short – maybe the best of the bunch – that made me long for more. 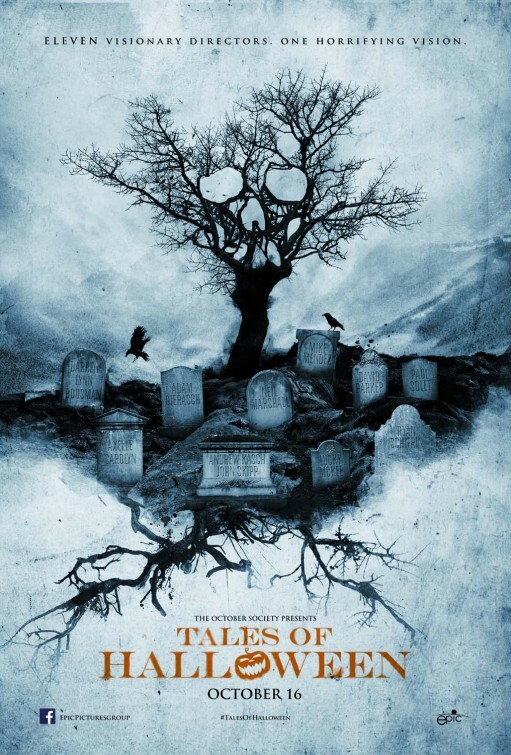 Although “Tales of Halloween” hits a couple snags when it goes for the abstract like in “Ding Dong” or its motivations aren’t clear such as “Trick”, both of which feel more like film school projects than well-executed shorts. At least the feature maintains a steady pace and is truly looking to either make you gag, chuckle or jump in your seat. It may not have been satisfying to me as a whole, but I got enough of a kick out of “Tales of Halloween” and it should entertain a specific audience.